Powertech’s group of experienced Engineers and CGSB certified Inspection Specialists offers a complete set of traditional field and lab NDE services to our customers. Powertech’s Materials Engineering experts perform NDE and life assessments for structures, equipment, and pressurized components. Assessments are performed considering brittle fracture, overload failure, stress rupture, fatigue, corrosion-fatigue, stress corrosion, and creep mechanisms. In an operating environment, machinery and equipment may be damaged by fatigue, creep, corrosion, erosion, or cracking. Regular condition assessment can identify any such deterioration, and mitigation measures can then be applied to extend service life. 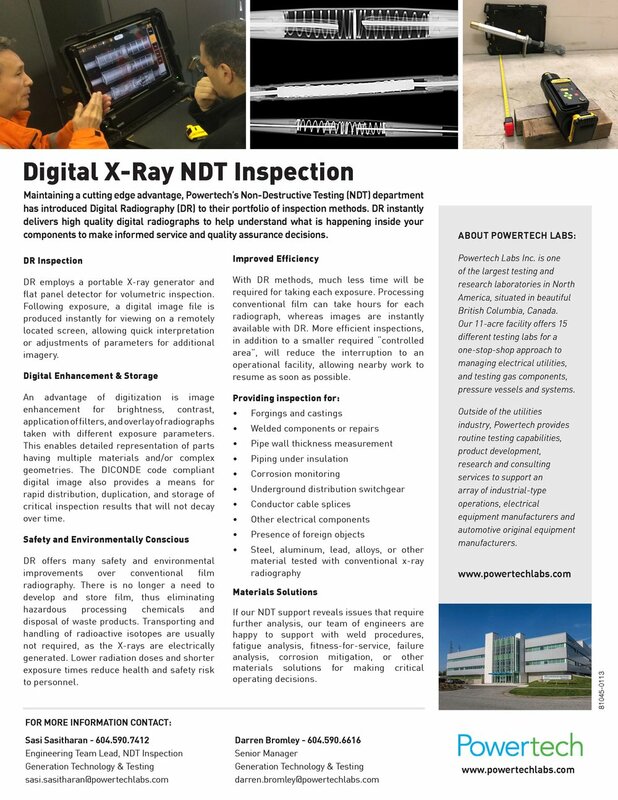 Condition assessment techniques include non-destructive evaluation (NDE), which is used to determine whether equipment and components are in safe operating condition, and life assessment, which is used to determine whether design life can be extended. In addition, we specialize in development of innovative inspection techniques and equipment for custom testing applications in a variety of industries including power utilities, manufacturing and transportation.